Potato bars are such a fun and simple dinner…where everyone gets to make their own dinner and you don’t have to short order cook! Well, it’s FAR TOO HOT outside to be baking potatoes in the oven. Just the thought of 400 degree oven running for an hour right now makes me sweat. BUT…you can cook the potatoes in the slow cooker without heating up your kitchen! I also love this because I can cook a bunch of potatoes all day, while we enjoy an afternoon at the pool…then we all come home ravenous and all the boys get a hearty and filling dinner to enjoy! 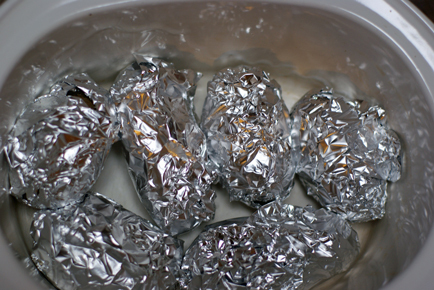 Get the full recipe for Slow Cooker Baked Potatoes here. 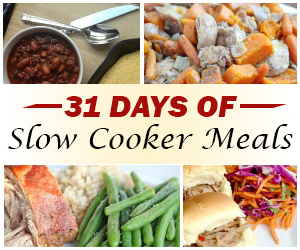 Welcome to our 31 Days of Slow Cooker Meals! July is a HOT month for most of us and one of my favorite ways to keep the kitchen cool in the summer is by using my slow cooker. Each day for the next 31 days, we’ll be sharing tasty and easy slow cooker recipes with you. Be sure to bookmark this page as all of the recipes will be automatically added each day. Enjoy and be sure to share all of our favorite Slow Cooker meals with your friends and family!